This is my concise reference on profiling the execution of computer applications. Profilers usually insert themselves at the byte-code level where machines execute instructions. But the location of execution needs to be presented in a way that is comprehensible to mere mortal coders. So profilers usually work with source code IDEs (Integrated Development Environments) such as Eclipse and Microsoft Visual Studio. Java with Java Virtual Machine Profiler Interface (JVMPI) C JNI interface where profilers may access the state of the JVM via an in-process native agent, and can be notified of interesting events like object allocations and method invocations. 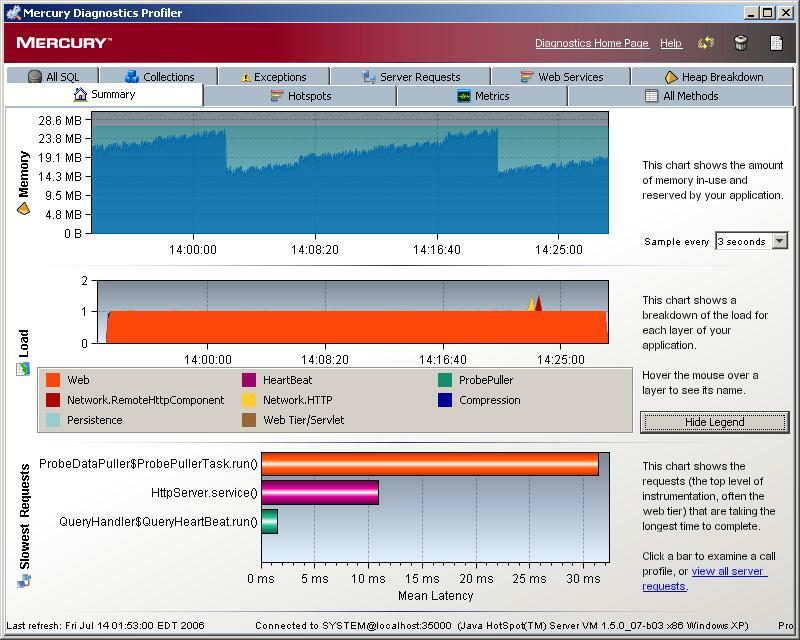 VMGEAR Optimizeit tools pinpoints performance and reliability issues throughout the development process. The Sitraka JProbe Suite contains a Profiler with Memory Debugger, Thread Analyzer, and Coverage analyzer on BEA WebLogic. 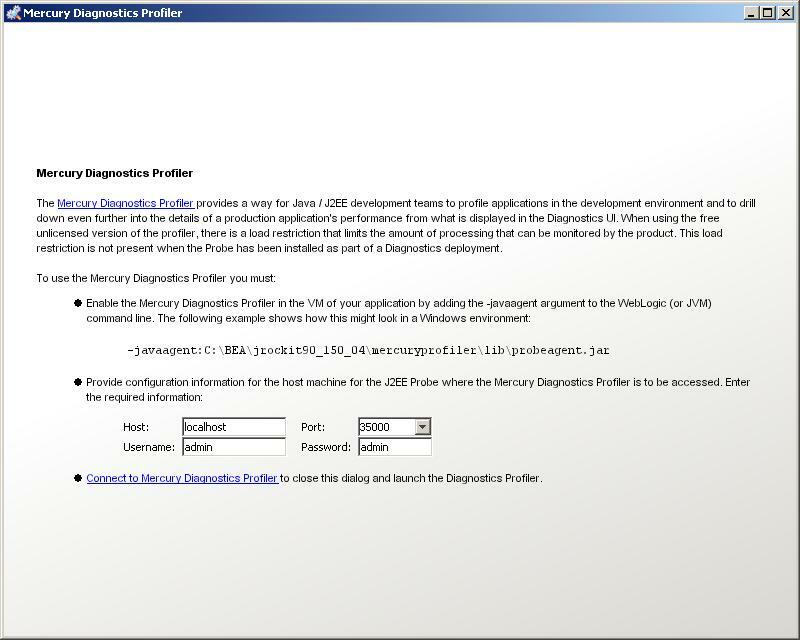 Before being acquired by HP, Mercury used to offer a free download of the Diagnostics Profiler. The merc.diagnostics-profiler.zip file is 405,672 KB. 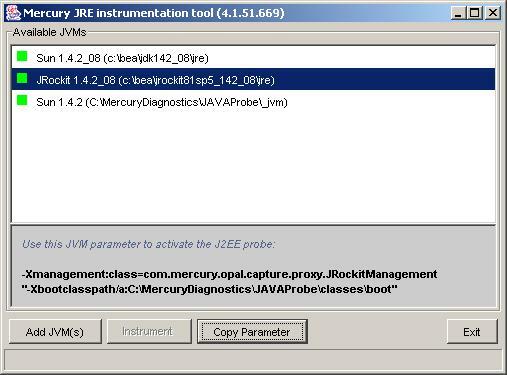 When executed, it creates by default a "JavaProbe" folder within C:\MercuryDiagnostics. Also add -Xrunheapdump to enable heap dumps within the profiler. Click Exit and Paste the text in the JVM startup script file. Closing the command window shuts down the service. Paste the string and click "Apply". Restart the server: Navagate to "Control" > "Start/Stop" and click "Graceful shutdown of this server..." and confirm "Yes". Wait for "TASK IN PROGRESS" to turn to "STOPPED". Then click "Start" and Wait again for "TASK IN PROGRESS" to turn to "STARTED". 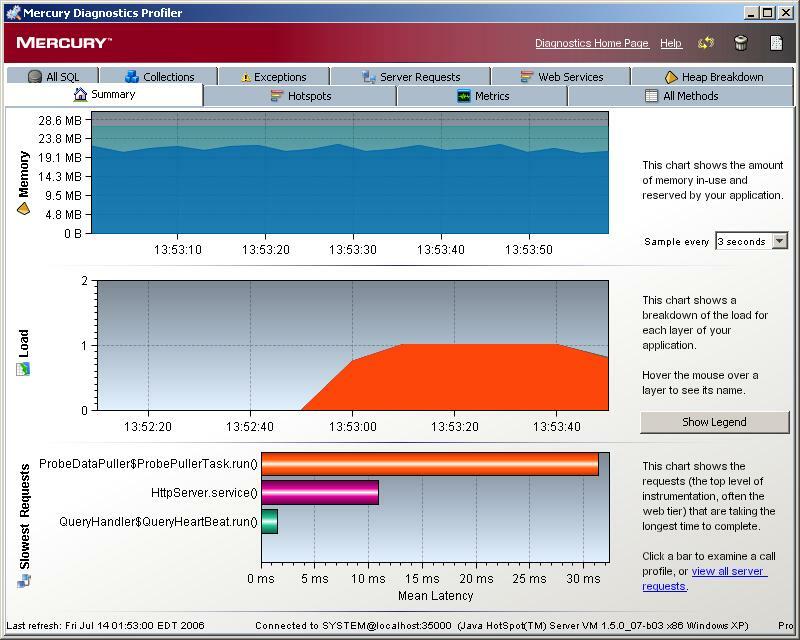 Click the "Connect to Mercury Diagnostics Profiler" link for this screen which graphs the Memory used, the Load, and Slowest Requests. http://localhost:35000/profiler/ (after authenticating for default "admin" userid and password) opens an internet browser with the same (albeit slower performing) Java applet. Mouse over the graphic for tooltip information. "Hotspots" tab graphs the "Slowest Methods" and "CPU Hotspots"
"Collections" require light-weight memory diagnostics instrumentation and capture to be enabled in the probe. "Exceptions" only for instrumented methods. The profiler tracks where time is spent by each J2EE instance? ??? How does it identify memory leaks during GC?? It tracks hold times by sychronization lock ??? It counts exceptions and trace information ??? The J2EE Probe captures events such as method invocations, collection sites, and when business and server transactions begin and end. The basic strategy is to identify the most time consuimg component, identify tunables, conduct tuning experiments, then move on to the next component. So rather than immediately going to the most likely component, it's best to begin with an open mind. The value of a profiler is that it may identify issues in components where you didn't expect to cause delays.